(Nanowerk Spotlight) An early concept regarding molecular machine comes from Richard Feynman, who proposed a special molecular device to transform thermal energy into mechanical energy. Over the past two decades, many naturally existing molecular machines, most of them protein-based, were recognized, such as the myosin, kynesin, as well as the ion channels in cell membranes. At the same time, synthetic chemists also brought into reality many artificial molecular machines, whose motion could be controlled via light, heat, or chemical reactions (read more: "Off to the races - artificial nanomachines are playing catch-up to nature's molecular motors"). Most molecular machines operate by using chemical reactions, which lead to irreversible damage to the machine molecules themselves over time. Moreover, in most scenarios, the measurement and control of the molecular machine status are separated into distinct steps, e.g., the molecular motion is controlled by a chemical reaction, but is then detected by spectroscopy or electrochemistry. Researchers have now proposed a new type of molecular machine without chemical reactions and where the measurement/control mechanisms are combined into one. They report their findings in the October 15, 2013 online edition of Nano Letters ("Single-Molecule Electric Revolving Door"). Termed 'single-molecule electric revolving door' (S-MERD), the system utilizes single-molecule conductance dependence upon molecular conformation as well as destructive quantum interference. A series of phenyl-acetylene-macrocycles (PAM)-based molecules (molecules 1-3) and molecule 4 in the figure below form candidate systems for such a S-MERD. "The major breakthrough of our research is that for the first time, a molecular scale 'electric revolving door' has been proposed and designed," Liang-Yan Hsu, a graduate student in Herschel Rabitz's group at Princeton University and the paper's first author, tells Nanowerk. "The working principle of this molecular electric machine is to control its opening and closing by an applied electric field and to simultaneously detect its states by electric current passing through the molecule. This is an entirely new concept to the field of molecular machines." While Moore’s law has motivated engineers to miniaturize electronic components in integrated circuits down to the nanoscale (commercial transistor structures have already reached the 14 nm node), scientists are also keenly interested in the electronic properties of single molecules and possible single-molecule device structures (see for instance: "An electric motor made from a single molecule"). "This led us to think about the possibility of combining the two – electronics and molecular machines," says Hsu. "In the field of modern electronic technology, most devices are based on metal-oxide-semiconductor field-effect transistors (MOSFETs), which serve as on-off switches for electric circuits. In this regard, the S-MERD could form an excellent current switch, with an on-off current ratio as large as five orders of magnitude, and a switching speed faster than a nanosecond. In addition to the switching functionality, the opening and closing mechanism of this S-MERD, controlled by electric signals, is analogous to the channel switching in cell membranes." "The S-MERD is only one example in a family of single-molecule electric machines," note Rabitz and Elise Y. Li, an assistant professor in National Taiwan Normal University. "We believe that, in the near future, the combination of single-molecule electric machinery with the techniques from Nanoelectrochemical Systems (NEMS) or Microelectromechanical Systems (MEMS), will be able to provide extensive applications with a wide variety of functionalities. For example, a nano-robot might be created by an integrated set of single molecule electric machines. This could potentially have a large impact in the biomedical sciences and other fields." 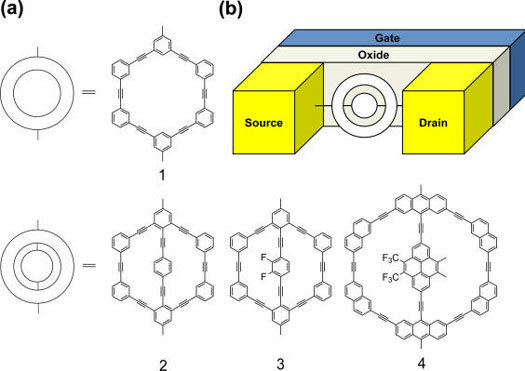 At present, the idea of combining electronics and mechanics at the molecular scale poses significant experimental challenges to bring this into reality, not to mention commercial products. But this kind of research might motivate other scientists to explore the practical prospects in the years to come.